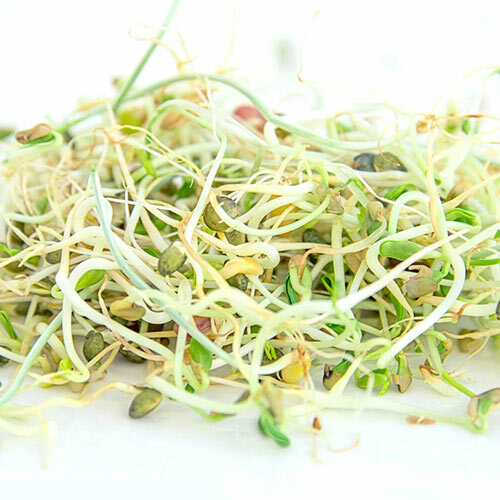 Our Ancient Eastern Sprout Blend includes four sprout varieties: fenugreek, lentil, kamut and adzuki. Rich in flavor and antioxidants and high in fiber, this blend is loaded with vitamins and minerals. It has the perfect crunch and flavor for sandwiches, stir-fries, soups, salads and snacking. Sprouts are easy to grow indoors at home year-round. The Ancient Eastern Sprout Blend is ready for harvest in just 3-4 days. Sprouts are ready to eat and most tender when they are just a few centimeters long. 4 oz. CommentsIt is recommended that sprouts be grown indoors using a seed sprouter. Sprouts grow best between 65F and 75F. No sunlight required however light results in greener sprouts. To grow sprouts in sprouter: 1. Place small amount of seed in a small jar or container and add just enough water to cover the seed. Cover the jar with a piece of cheesecloth or paper towel and secure with a rubber band. Soak the seed overnight. It is normal for the seed to swell. 2. After the seed has soaked overnight, drain the water through the cheesecloth and rinse seed thoroughly two or three times. Make certain all excess water is drained. 3. Spread the seed evenly in a thin layer on a seed sprouting tray. 4. Repeat rinsing and draining three to four times a day to prevent the seeds from turning sour or getting mold. Seeds or sprouts that have a foul smell or develop mold should be discarded. 5. Seeds will mature and be ready for eating in 3-4 days after the initial soaking. Sprout seeds may be sown in a shallow dish or pot filled with light potting soil and watered as needed. As the sprouts grow, they are clipped with scissors for use. Sprouts may be grown between two paper towels. Seeds are spread thinly between the paper towels, then the towels are moistened. Add water when the towels start to dry out. Once the seeds have sprouted, they may stick to the towels or may mold if left too long.